You might remember us getting our hands on the Mitakon Speedmaster 135mm F1.4 at the Photo Plus Expo back in October. We handled the lens and wrote up some quick impressions at the show, but we were lucky enough to be given one of the prototype lenses to take home to Seattle with us. Our sample is an engineering prototype of the E-mount version of this beastly lens, and we've spent the past few weeks gathering samples both in our studio and out and about around Seattle, to give you an idea of what it can do. The 135mm F1.4 is a massive piece of glass, and in its E-mount flavor, absolutely dwarfs Sony's a7 bodies. With a 105mm thread, fully manual operation and a weight of over six pounds (about 2.7kg), it can be rather intimidating, and is near impossible to use hand-held. With the proper support in place though it isn't difficult to use at all, and can reward patient use with dramatic, unique results. With that in mind, take a look, and enjoy with us this truly unique hunk of metal and glass. Let us know what you think in the comments! So... who or what market is this intended for? 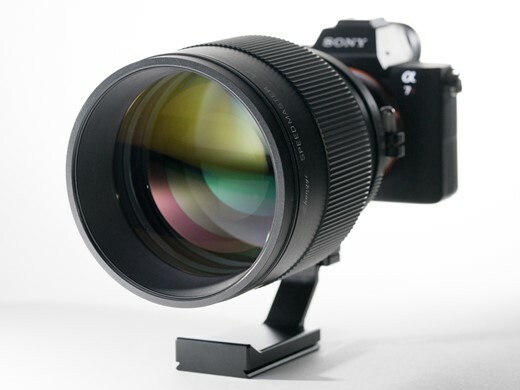 The Sony/ Minolta STF with an adapter may well be worthy of consideration over this lens. This lens places itself where? Big,bulky, I worry about the balance point and worst of all "The Bokeh", no buterey smooth dropoff. Sorry its awfull. ok, fine, if i were so rich as to be a photo equipment collector too, i'd certainly pay dearly (or wait for a cheap used one to become available on ebay or somewhere) and add this 'little toy' to my collection of the odds and the curious too! but seriously, what is this lens good for in the end? i'd really like to know if someone has a good answer, thanks. Why? It's huge, heavy, seems to be ill suited to hand-held work, and to be honest, the quality isn't that good, going by these samples. Unless one is in the surveillance industry, I'm trying hard to think of a reason why anyone would buy it. Perhaps it is just Mitakon making a statement. We can, so we will. well, this lens doesn't seem quite fit even for surveillance really, is it? The Nikon 200 f/2 is seen as a drool-worthy legendary piece of kit. It's basically the same size and weight as this lens. What exactly makes this lens a mere vanity project? Don't see anything in the photos that blows my socks off with this huge lens. I honestly can't see much difference between these shots and the Canon 85mm F1.2L. Plus, the Canon autofocuses very accurately - which is what is needed when you have 1/4" DOF up close. in addition, you can hand-hold it and it costs less. Good points, but it is the difference between an 85mm and a 135mm. That is a huge span. the "span difference" between an 85mm and a 135mm is not that much really, in terms of FOV at least! the open aperture is a great item though, provided it doesn't sacrifice other more important factors of course! I guess we disagree on this one. The 85 can be used very effectively indoors and within conversation distance of the subject. Then135...not so much. My original post was to the OP. he stated the interchangeability of the two focal lengths. inside a normal sized room, one gets you a head shot, the other gets you eyes and nose. Hey, guys. Just getting around to reading this. I really don't see much difference between 85 and 135mm. It's what, about one good step closer using your feet. And the DOF looks about the same with the same framing, I would imagine. And without autofocus, it would be useless for portraits, in my opinion. Looks impressive, though! I use a Nikon 135mm F2.8 AI weighs about 400g, absolutely stunning portrait lens, and it cost me £90.00. Wow, a 3 Kg lens for portrait work. Amazingly not practical. Maybe it can be used in the studio with a tripod, but then why do you need f:1.4? Basically, no one will buy this lens, so why did Mitakon make it? The point everyone is missing is that now Mitakon has all of us talking about Mitakon. They have made this amazingly interesting, impractical lens and they are showing everyone what they can do. We all talk about it and think about Mitakon and when Mitakon comes up with other lenses, all of a sudden, Mitakon is a brand we recognize and we buy their other lenses. I think this is Mitakon's main purpose behind making this lens and I think they have done the right thing. I think you have got a very good point there!! is not a company to take serious. Everyone talking about it... as if it were a car wreck. Great shots for evaluating this lens! Nice is the comparison shot of f/2.8 vs f/1.4. I wonder if you have the same shot in f/2? Just to see what is the difference in bokeh going from f/2 (Samyang) to f/1.4 (Mitakon). I was wondering why Mitakon made this lens. After seeing the photos I am impressed and will remember this brand name. I'm going to wait for the f0.95 version, I hear they are only making 10. I really think you guys need to start to put a break on your highlight and shadow recovery especially on your portrait shots. That makes really difficult to judge the lens characteristics. The pictures looks so nervous and unnatural, it does not go well with the softness of such a fast lens wide open. If you check the RAWs they're that way out of camera. That lens seems to have very low contrast and tends to illumintate the dark OOF areas. I wonder if they're trying to guage the popularity of this lens by limiting it to 100 pieces or whether someone has specifically asked for it so they're making 100 to justify the R&D? 2,999 USD for the Nikon F. The focusing distance is 1.6m so I can't use the glass in my work. I have try the out some of theSchneider-Kreuznach Xenon FF-Prime Lenses and they are stunning, expensive but wow! New standard. shots are nice. v difficult to nail focus was my comeaway thought. Would it be possible to do more of "product photography" with this lens? I honestly can't see anyone using 1.4f at 135mm on a living subject, but I think it has very situational but unique capabilities in photographing inanimate subjects. The lens has been returned, but if a production copy finds its way here I'll see what I can do for you. Is there a scientific measurement for how gracefully a lens renders the transition between in focus and out of focus? This lens seems to do a decent job but I'm wondering if there's a way to measure it. The CA control seems to be better than expected. Image quality reminds a bit of the Voigtländer Nokton, which means "nice", adorable but also unreachable. I've got the Nikkor 135mm f/2 AF DC which is much more manageable to hand hold and has the advantage of AF. The extra stop wouldn't justify the inconvenience for me. Really impressive piece of glass! Looks pretty good wide open, and doesn't seem to have much of that "bokeh CA" that I'm used to seeing on fast teles. Really looks like a top-notch optic... which is incidentally also true of their latest focal reducer (which I've just recently tested in detail). To me this lens is about as useful as a freight truck that can do 0 to 60 in 3 seconds. Anyone interested in a fast 135mm might be interested in Samyang's 135mm f2. It sells for around $550 retail and $450 gray market on eBay, and reviews indicate stellar optical quality. Available in various mounts, including MFT. I'm considering it for low-light event work. Manual focusing, no vr seems to be deal breaker for me. Considering tamaron 70-200 2.8 VC is close to 1200. It is 2.8 but gives 3 stops of vr advantage for hand held low light shots. The Tamron is $1,500 at B&H, almost 3 times more expensive than the Samyang. It's also one stop slower. It doesn't come with an MFT mount. And, I've already got an f2.8 telezoom. As for VR, it doesn't help much with moving subjects in low light, and my camera's IBIS provides it already. These fast primes are for folks for whom an f2.8 zoom doesn't cut it. Because it's a 135/2.8, and those have been around in droves forever. If I didn't need the extra stop for low light I'd have a $250 used Contax 135/2.8 already. STF means it is an apodisation lens. Its a very special lens. Super buttery bokeh is what you get. Looking at Mitakon's website, I see that they are offering a F/2 135mm FX (202.5 DX) lens for only US$199. Fully manual, of course. It would be interesting to see a review/samples. MPS, Mitakon's website (www.zyoptics.net) lists the forthcoming 135/1.4. I don't see a 135/2. Can you provide the link? MPS, for $200 for a manual focus 135/2.8, I'd rather get a used Contax/Zeiss. The image quality seems pretty good. I like the bokeh, the very flattering perspective too (from that FL as a long portrait lens). The lens looks like a real beast. It might balance a little better on Nikon or Canon full-frames with their larger bodies. A MF lens with that weight, bulk, and thin DOF really demands good support to give you a chance. Two negatives jumped out at me one was the many of the photos seems a little soft and/or front focused. I suppose working with such a thin DOF must be very challenging. I've used 85 1.4 and 200 f/2.8 and both can be a challenge to nail focus with. This being a manual focus lens no doubt makes this even more of an issue. The other was cold tone and seemingly poor DR of most of the images. Part of that would be the lighting used and/or what natural light is like here in the PNW. This was more of a style thing, and not lens related. Nice lens image quality. Surprised to see usable 1.4 aperture. For $3K it surprises you? It's not made by German elves so it doesn't cost $15,000. Nonsense. Every 85mm f/1.4 lens I've seen is usable wide open from Nikon's $1800 unit to Samyang's $300 lens. I have the Samyang and to me it's not usable at 1.4. Way too much PF. Well, pointless discussion of subjective points. This is a first and looking better than the famous Zeiss 135 1.8. at 1.4. What will be the m43 equivalents when this lens is adapted for my pocketable PEN? To me, it's got limited use because of its lack of mobility. Street photography, you can't really hand hold it, so that's out, sports - out, nature photography it's to short, landscape it's to long, weddings to long, etc. In high school in 67-69 I had an SLR with a 135 lens that I used for shooting football games from the sidelines. I hated that lens and finally a year later I got a 105 yet in many instances that was a tad bit to long. I rarely used that 135. The best overall fixed lens I have is a Nikkon 85 1.4 which is completely manageable hand held and has a wide enough angle of view as to not be constraining. Now, these are my own views, I am sure there are people out there that could not live without their 135 so by all means, have at it, as for me, I wouldn't bother, though admittedly it is rather awesome looking, but also intimidating to the one being photographed. 135mm seems like the wrong length for landscape, but it is very surprisingly useful, particular in isolating a particular view. I use my a lot in landscape; but also find the 85mm very useful there. Like I said, its a great lens for some, and not for others. I have not used a 135 since my high school days having such distaste for it over those few years. Plus it has as much to do as being to long as it does for being slow. In retrospect, I think the 85 would have been a great lens for sideline shots as any lens, that is, if I was stuck with a fixed lens. Back then zoom lenses were rare, very slow and extremely expensive and about as sharp as an extremely dull knife. Plus, I needed every extra stop I could get since a lot of it was shot in late afternoon sun with TRI-X pushed from 400 to 800 (ASA) or more using a developer of dubious quality. My camera was a Miranda D, I don't even remember what the lens mount was, I think Nikon. I had 85mm 1.4 , 85mm 1.2L, and 135mm f2, 135mm 1.8 Autofocus from Sony. And I found out, I love 135mm for everything. From looking cool to wedding photos, everything, just 135mm, I uses my 135mm as my everyday. On my m43 camera, the 75mm x 2 = 150mm as my everyday too. Small and mighty for street photo. These 85mm is good for APS-C , however, in Full Frame, your object look the same with other photographers, I want 135mm, because I want my photo look different, beautiful. Look like a very good lens and probably affordable to. More amazing is the 7RII...Still candy colors, but more organic. The gallery isn't working properly. Funny, 'cos usually they work, albeit at a snail's pace. I just get the first picture without any info or options to click on anything. Regarding that mounting foot... TWANNNGGGGGG!!! DOF with a FF camera with this lens at f/1.4 with a subject at 7ft is 0.48." But lesser DOF is always better, right? DOF is too shallow for me at 50mm f1.4 on a 4/3 sensor. Yet I've learned here that my camera iis inferior because DOF is not shallow enough. Conclusion: DOF can't be shallow enough. Shooting subjects at 7ft is the first rule of photography. IN portraits (so say the DOF fetishists) only the RETINA of the EYE should be in-focus!! I'm quite certain if the DOF fetishists say they only want the RETINA of the EYE they mean they want only the IRIS of the EYE instead. I own Voigtlander and Mitakon lenses and the Mitakon build quality, while very good, cannot be confused with that of a Cosina lens. Also, smaller size doesn't come for free. The Voigtlander 25mm lens focuses down to 17cm, whereas the Mitakon focuses up to 25cm. Basically, if you dig into it, you will find justification for the differences in price and size. It looks really decent to me, people criticizing it harshly seem to be ignorant to how challenging a lens like this is to design. Compared to the 135mm 1.8 and 1.5 lenses from the 70's and 80's this is simply astonishing wide open. It's actually usably sharp in the center wide open! The bokeh seems to be a bit of a mixed bag and like a lot of lenses it depends how far out of focus something is. When the background is very out of focus it seems very smooth and buttery. When things are less out of focus it seems much busier but this can be said of many lenses. Overall I think it's pretty impressive considering the extreme specifications. Not something I would buy but it certainly has a distinctive look and seems to offer usable performance wide open. Whoever invents such a lens will be a millionaire over night. 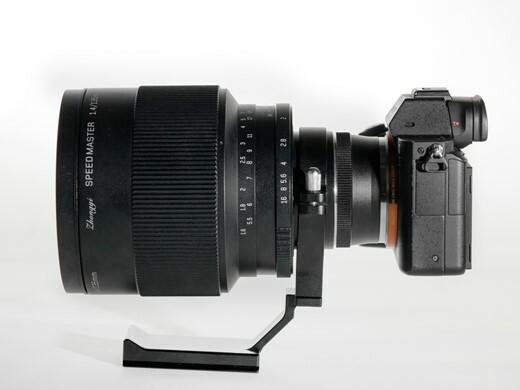 Imagine telephoto lenses the size of 24mm? That would be a real breakthrough in many ways. L EEEEE N N SSSSS !!!! L E NN N S !!! L EEEEE N N N SSSS !!! LLLLLL EEEEE N N SSSSS !!! When I see what modern glass can do wide open, part of me is tempted to straight up dump all my vintage primes (I won't). I'll never own this lens, but I sure would love to rent it in the future. Haha formatting killed it, but you might see what I was going for up there. What's with the dinky little tripod mount? Indeed, it looks like it's bending just sitting there on a table. Just noticed the pre-order price. $3,000 USD. I don't think I need the f1.4 speed that much. I already have the Zeiss 135/2 which is a wondrous piece of glass. This lens will have a lot of competition in this price bracket. It's produced in limited numbers, which means that it's meant for those that actually need those specs and wouldn't be satisfied with an f/2 lens. I am sure that must be true. I use the f1.4 a lot on my 85/1.4 Zeiss. Very nice bokeh, indeed... And interesting how the specular lights in the background of the fist portrait shots create a kind of "mini aperture" that brings back the fine detail's of the subject's silhouette, which otherwise is OOF. Neat effect. Bokeh looks "busy", and not very subtle in its rendering. The colors remind me of my Pentax FA 77mm Limited which I used to own, but without so much microcontrast. Surely a comparison with the A mount Zeiss 135mm 1.8 would be the most suitable? That lens also comes with pretty good AF on an a7 body with the LA-EA4. Thanks for the samples, seems like a fun (although probably a bit of hardwork) piece of glass. - Possibility to view the picture fullscreen, I have a 27" IPS as many people do, I find it handy to asses what a picture would look like at print size (I print rarely bigger than the size of that screen... and when I look at past shot I do it fullscreen, not with a huge black panel on the side). It would be equally interesting on a 13" (because 13", even retina, isn't that large...). Love the 'bokeh' shots, (DSC05193, DSC05175)! Almost looks like a Photoshopped background! Can you post a comparision with a Canon 200 f1.8 or 200 f2 IS, should be an equal look. Edit: But with autofocus and IS. I wanna see that as well but to give the SpeedMaster a chance, they should really compare it to the Nikon 200mm f2. Where is the camera? :) It almost looks like a lens stop .. I'm not very charmed by its bokeh. That's a personal thing of course, but especially in the motorcycle shot I get nervous from even looking at it, it is so distracting. some shots are nice though, when you get a bit more distance (like in the one of the man sitting on the ground). But any other lens would probably have resulted in as nice a shot, like with the Canon 135mm. Great showcase of Mistaken, but quality wise (in image, not build) it looks like something Sigma has build 10 years ago.